Whatever the occasion, a corsage often accompanies special and significant occasions. Whether your corsage is from a prom, a wedding or another special occasion, save those precious memories by preserving mementos (such as flowers) from the event. As beautiful as the corsage was when you wore it, you can keep it beautiful for years when you dry out a corsage using silica gel. Pour approximately 1 inch of silica gel into the bottom of the jar. Place the corsage into the jar gently. Set the corsage on the silica gel so the bottom of the corsage is on the silica gel and the flowers face up. Make sure the corsage looks the way you want with all the flowers facing the right direction. Pour more silica gel slowly over the corsage. As you pour, make sure the flowers do not move or shift with the weight of the silica gel. Shake the jar gently to distribute the silica gel. Continue pouring the silica gel until the entire corsage is 1 inch beneath the silica gel. Seal the jar with the lid and put the jar aside in a warm and dry location. Leave the corsage drying in the jar for approximately four days and then check the drying progress. If the flowers feel papery when you touch them, the corsage is dry. If the flowers still have moisture in them, bury the corsage beneath silica gel again and leave it drying for another two days. 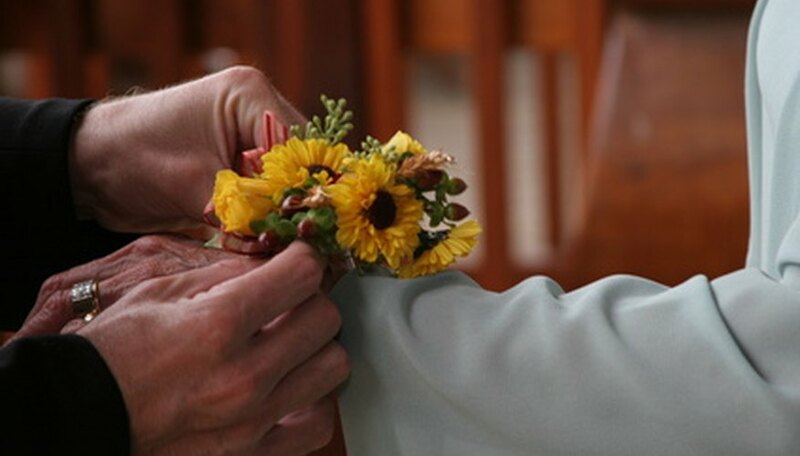 Remove the corsage from the silica gel when the flowers are completely dry. Gently shake the excess silica gel from the crevices of the flowers.